I have a large head (not the same as neck floof) but I understand Kades’ plight. Also, I’d imagine that wearing clothes over fur would be quite uncomfortable, especially for thicker-furred breeds. I agree! I have a thick -neck- and crewneck shirts are very uncomfortable. Do I want to look good… or do I want to BREATHE…. Looking cool > feeling cool? I’d imagine that clothing gets more common in winter, and less so in summer. To deal with the temperature change. Collars or furred ftw (In furry) :3 Also I’d think it’ll look wrong if Tim made them clothed, but that might just be my opinion. I hate when BigDogs put the design on the back of the t-shirt x.x I wear zip up hoodies all the time. But seriously, always seemed odd to me for furry critters to wear clothes when it’s not for extra warmth or style. I guess it depends on whether you view them as humanlike (and thus not having clothes is lewd) or animal like (not having clothes is normal). I remember when I had a shirt with the Wii logo on it, I used to wear it all the time. -I wear clothing. Only because I’m shorthaired. That and I really like hoodies and jumpers. Pants are another story. Gotta tear a hole in them so my tail can fit. Jeans are uncomfortable for me. So loose or baggy pants suits me best. ‘Sona-wise, all my trousers, jeans, and underwear have a standard tail-hole in them. 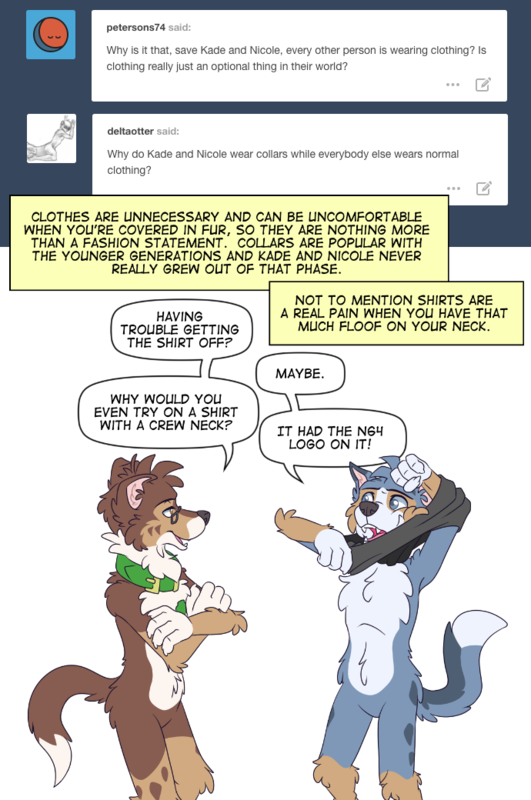 And on my top half… meh, I just make sure I put stuff on carefully so it doesn’t rub my fur the wrong way.